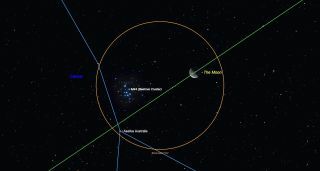 For the second time this month, the moon will pass close to the Beehive Star cluster in Cancer. This time, the orbital motion of the last quarter moon (green line) will slowly carry it towards the cluster – starting 6 degrees to the upper right of the cluster when it rises after midnight, and closing to within half that distance as the dawn twilight begins. Based on the latest national forecast, skies will be clear on tonight (Oct. 31) across approximately half of the United States as costumed kids arrive at the door looking for candy or some other Halloween treat. The southwestern U.S., including a swath of the central and western Great Lakes region as well as the adjacent Northern Plains, should have generally fair skies. So, too, will the Middle Atlantic and southeast U.S. coast, including much of Florida. Saturn is the first object to vie for skywatchers' attention as the planet descends the west-southwest part of the sky. It glimmers into view during twilight, with its rings still wide-open and its north face tilted some 26 degrees to our line of sight. But if you hope to show Saturn off to trick-or-treaters through a telescope, do so as soon as it gets dark. Later in the evening, the planet's image will likely be shivering and churning about, due to poor viewing quality near the horizon. Saturn sets about 3 and a half hours after sunset. There's another planet that will attract the attention of most folks, because it's brighter and more colorful: Mars, which will appear as a very bright, fiery colored object well to the right of Saturn. Its reddish-orange tinge suggests the color of blood, which is why this planet was named for the Roman god of war. As has been the case since late summer, Mars is in the south-southeast when twilight ends. Its distance from us on Halloween night has receded to 73 million miles (117 million kilometers) and currently at magnitude -0.6, it shines just a trifle dimmer than the second brightest star in the sky, Canopus. Unfortunately, telescopic views of Mars' small disk are now relatively mediocre. Still, some of your neighborhood ghosts and goblins will likely want to see it. One good reason to keep a sharp eye on the sky on Halloween night is for the possibility — albeit small — of glimpsing a spectacular fireball meteor. The Taurid meteors, sometimes called the "Halloween fireballs," begin showing up in mid-October and continue into mid-November, but Nov. 5 to 12 is traditionally when these slow and majestic meteors are at their best. This is a very good year to look for them, because the moon will not be around to light up the sky and hinder the view. The Taurids don't produce a lot of meteors — maybe a dozen during an hour's watch at the very most, and usually much less. But for the Taurids, it's quality that matters, not quantity. Meteors, popularly referred to as "shooting stars," are generated when debris enters and burns up in Earth's atmosphere. The Taurids are attributed to debris left behind by Encke's Comet or perhaps a much larger comet that, upon disintegrating, left Encke and a lot of other rubble in its wake. Indeed, the Taurid debris stream contains noticeably larger fragments than those shed by other comets, which is why this meteor stream occasionally delivers a few outstandingly brilliant meteors, known as "fireballs." If one of these flares across the sky on Halloween night, it might even make the kids temporarily forget about candy! And here's a "constellation prize"
It's sort of strange that in a night sky, where a variety of strange beasts and creatures proliferate, no witches, ghosts — or even a creepy spider — are recognized as constellations. But we do have a gorgon, or at least the head of one, visible in the northeast part of the sky. The gorgon is Medusa, who had snakes for hair and was, according to legend, so hideous that looking at her would turn you instantly to stone. In our current evening sky, ascending in the northeast is Perseus, the hero, who slayed Medusa by beheading her with his sword. In the sky, one of Medusa's eyes is marked by the star Algol, which has been known since ancient times as the Demon Star and is one of the most famous variable stars in the sky. Its very name, from the Arabic "Al Ra's al Ghul," means the demon's head, and ancient astrologers considered Algol the most dangerous and unfortunate star in the heavens. This seems to suggest that medieval stargazers were aware of this star's ability to mysteriously change in brightness. In 1782, amateur astronomer John Goodricke realized that this star was really a pair of stars orbiting a common center of gravity and that when the dimmer of the two crossed in front of the other, the light from Algol appeared to fade. Unfortunately, this stellar eclipse, which occurs like clockwork at intervals of 68 hours, 48 minutes and 56 seconds, will not take place on Halloween night. But one is scheduled for Monday night, Nov. 12. That night, Algol will be at its minimum brightness at 9:02 p.m. EST (6:02 p.m. PST, or 0202 on Nov. 13 GMT). Normally, Algol appears 3.3 times brighter than it does during the peak of the eclipse. Two hours before the predicted minimum, start checking Algol's brightness. It is at minimum light for about 20 minutes — as the large, dim star passes across the smaller, brighter one — then it gradually returns to normal.